The prevalence of chronic diseases, increasing research activities on recombinant-based proteins, protein expression bacteria and growing life sciences & biopharmaceutical industries are the major factors driving the growth of this market. 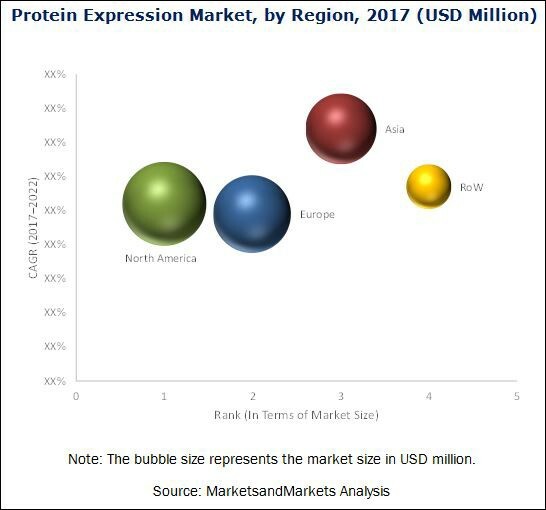 The Global Protein Expression Market is expected to grow at a CAGR of 11.5% to reach the US $2,850.5 million. Protein expression is a technique or methodology in which proteins are characterized, modified, and synthesized in the host cells. The selected protein is typically achieved by the modification or alteration of the protein expression process in a living cell. Various kinds of protein expression systems are used to produce a broad range of therapeutic proteins such as insulin, interferons, and interleukins. · based on systems type. Thermo Fisher Scientific Inc. (U.S.), Merck KGaA (Germany), Takara Bio Inc. (Japan), Promega Corporation (U.S.), Genscript Biotech Corporation (China), and Agilent Technologies Inc. (U.S.) are the top six players in this market. These companies have a broad product portfolio with comprehensive features and have a strong geographical presence. Further, these leaders cater to the requirements of major end users such as research laboratories and pharmaceutical & biotechnology companies. Thermo Fisher Scientific Inc. (U.S.) is a key player in the protein expression market. The company adopted product launches and acquisitions as its key strategies in order to enhance its product portfolio. The company launched the Nano LC System and Columns which is used in protein purification and protein expression process. The Thermo Fisher Scientific Inc. acquired Life Technologies Inc. (U.S.). After this acquisition, Thermo Fisher created a new business segment-Life Sciences Solutions, which includes a broad range of protein expression systems and their related products. The market is segmented into North America, Europe, Asia, and the Rest of the World (RoW). The market is dominated by North America, followed by Europe. However, the Asian region is expected to witness the highest growth during the forecast period. The presence of emerging economies like China and India; rising prevalence of chronic diseases are some of the key factors driving the high growth of this regional segment. MarketsandMarkets’s flagship competitive intelligence and market research platform, "Knowledge Store" connects over 200,000 markets and entire value chains for deeper understanding of the unmet insights along with market sizing and forecast.